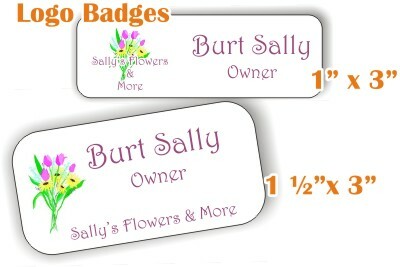 These are great little badges...available in over 25 colors, engraved with your choice of over twenty fonts...also available - if you have a "line drawing" logo, we can engrave that as well! Fasteners available are: Military clutch, Swivel Bulldog, Safety Pin or Magnetic Bar. Dress up the badges a bit with our Full-Color Logo Badges! 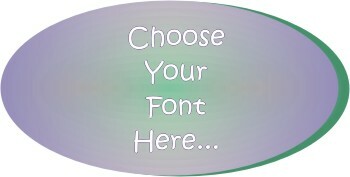 All we need is your logo and the names and titles, and you'll be blown away with your new, fancy look! Made with 60 mil. plastic, and available in white, silver or gold backgrounds. 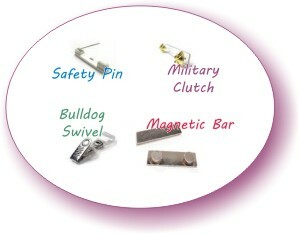 Fasteners available are Military Clutch, Swivel Bulldog, Safety Pin and Magnetic Bar. 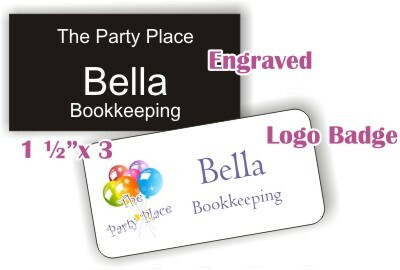 There are a few decisions to make, now that you have decided to look further into getting badges for your employees! If you haven't decided on size, format and whether or not you want round corners, do that, too...then fill in the form below for pricing...once you've approved the cost, we'll have the information on file that we need to place the order, except fo the names and titles...simple, huh? Remember, though, the information may be changed, if your mind isn't completely made up! • Safety Pin...poke it through - it's secure, but of course, your shirt or blouse will wear the scars of this one. In some instances, though, it's the best application. • Military Clutch...you know the one - this is what our military men and women use to "pin on" their medals. Squeeze on either side of the small piece, and fit it over the peg on the badge. Not so good for clothes, but again, a great application! • Bulldog Swivel...open the "jaws" and stick in your cloth - just like a bulldog, it holds on tight...and surprise - it swivels! • Magnetic bar...safest for your clothes, by far...but please make sure for medical reasons, that you can wear a magnet this close to your heart! Also, some medical facilities aren't able to order these guys! JUST A WORD OF CAUTION! Please fill out this Short Form, and Click "Submit"!